Many real estate companies recognize the need to deploy technology. But when it comes to doing so at scale across a large, diversified portfolio, it can be difficult to align teams, find budget, and stick to an overarching strategy. In this video, Enertiv’ Lead Software Engineer reveals a powerful strategy to scaling technology within a portfolio. Hi, my name is Felix Lipov and I’m the Lead Software Engineer at Enertiv. 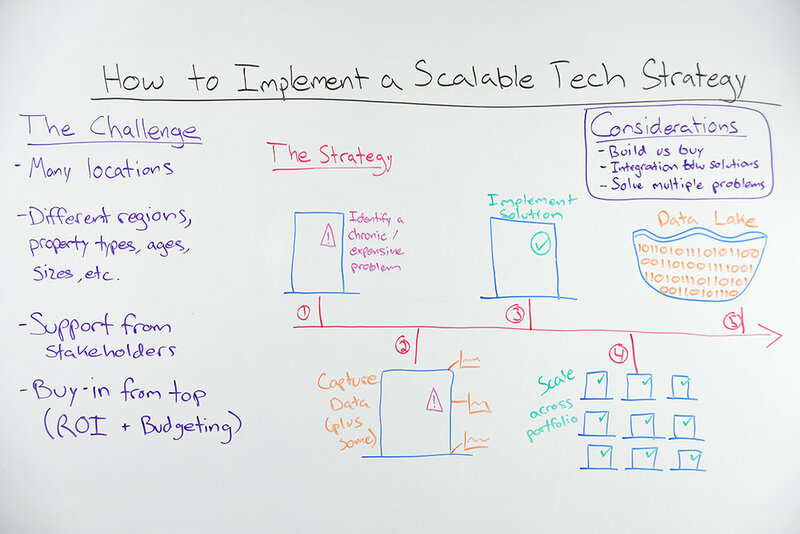 Today we’re going to talk about how to implement a scalable tech strategy across a portfolio. Now, if this were easy, everyone would be doing it. But there are multiple challenges. One, you have multiple buildings in different places; of different types such as commercial, residential, etc. ; with different ages and different sizes. Considering all that, to implement a strategy to scale technology and data, you need to get support across multiple stakeholders, but most importantly from the top. To do that, you need to get budget, so you need to demonstrate ROI. So, how have we typically approached this? Working with multiple leading real estate companies, we’ve come up with a strategy that is effective. What’s this strategy? Number one, identify a chronic or expensive problem. This could be elevator issues, freezing pipes, vendor or maintenance accountability, mysterious energy spikes that cost tons of money. Whatever it is, you’ve likely got a serious problem that you need to deal with. Number two, let’s get some data. But while we’re at, let’s not just get data for this particular problem, let’s see if we can get more data. You must build a wireless or cellular infrastructure anyway, so while you’re at it, go all in. And the funny thing is that in doing so and getting the justification to say: “this is working, let’s actually scale it,” you’ve in turn created a data lake. What is this? A data lake is all the data across all your buildings to help you really see what’s going wrong across multiple facets. The beauty is that, for the original problem we talked about, say, that elevator issue that wasn’t going away, when it shows up at another building, you already have the solution in place. You might even find problems before you realize it was there and solve it because you took care of it earlier. That’s powerful. There are some considerations for when you implement the strategy. Build vs buy. I’ll be honest, building a strategy like this can be hard. It takes a lot of knowledge and know-how in terms of not only real estate, but tech and data to make it work. Or you can buy or work with a leading vendor to help you implement this strategy on your behalf. Integration between solutions. So now we have data, we have maintenance, we have tickets, we have support, we have document repositories – see if you can get this all to work together, it will pay real big dividends. You also have multiple problems to deal with. Maybe you’re a head engineer, but the sustainability guy needs this data too. And guess what, the brokers and the leasing team, they’d love to use this data to help understand when tenants are moving in or out. There are multiple facets to how this data can be effectively used. Taking all that into account, we’ve realized through working with major portfolios that this strategy helps you get in the door and collect valuable data. No one’s doubting that data is very important, the question is do you have a strategy on how to really differentiate yourself as a company. This is what we’ve found is a great approach to do it. With that, my name is Felix. Thanks for listening, I hope that was helpful, see you next time. Have a chronic or expensive problem that data can solve? Contact us today and take the first step! What are the Economics of the Improved RTEM Incentive?